Mainstream laptops are generally designed for performance. They may, in addition, feature a longer battery life or a screen with touch capability, but they’re primarily meant to crunch numbers in the shortest time possible. That’s exactly what we’re looking for at Digit too. Mainstream laptops are getting more powerful, slimmer and lighter these days. Laptop makers are chopping off bezels in order to house a larger screen in a compact body. A glance at this machine’s specs should tell you enough about its speed. The Asus ZenBook Pro is the first laptop in the world to integrate a display in its touchpad, making it a second display. You could, for example, use it for playing a video on YouTube or have dedicated controls for a spreadsheet in Microsoft Excel. Under the hood, the ZenBook Pro packs an 8th-gen Intel Core i9, 16GB of RAM, and a 1TB PCIe solid-state drive. Graphics is handled by an NVIDIA GeForce GTX 1050 Ti GPU with 4GB of GDDR5 RAM. The ZenBook Pro tore through its competitors in our scoring sheet by a large margin. Battery life too was nearly on par with the Lenovo IdeaPad 530S. 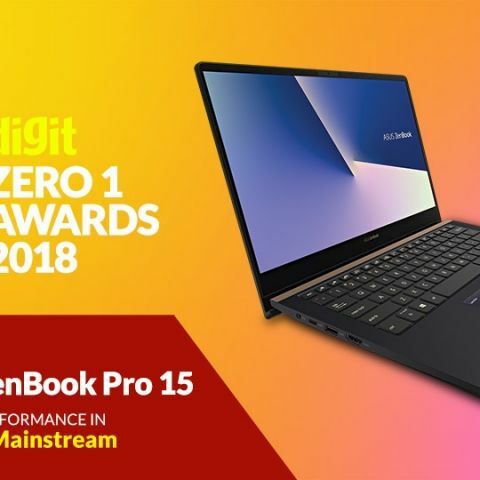 Without a sliver of doubt then, the Asus ZenBook Pro 15 is our Digit Zero1 award winner this year. The Dell Inspiron 7572 looks as subtle but packs interesting specs. Additionally, its web camera sits below the display. Inside its unpretentious exteriors resides an 8th-gen Intel Core i7 CPU and 8GB of RAM. An additional 8GB of RAM can be slapped on for an extra cost at a Dell store. For storage, it offers dual drives: a 128GB solid-state drive and a 1TB hard drive spinning at 5,400 rpm. For graphics, an NVIDIA GeForce MX 150 with 4GB of GDDR5 video RAM. That should be sufficient for lightweight video games. During our evaluation, the Inspiron 7572 was one-third of the distance away from the ZenBook Pro in terms of overall performance. All other numbers considered, it comes in at as the runner-up for this year. The Acer Aspire 5 may look as boring but can move swiftly. The Acer Aspire 5 consists of an 8th-gen Intel Core i5 CPU and a 1TB hard drive. The Aspire 5 is equipped with 8GB of RAM and 16GB of Intel Optane memory, which gives the hard drive an added performance boost. To handle graphics, it’s got an NVIDIA GeForce MX 130 GPU with 2GB of GDDR5 video RAM.